DETROIT - An emotional Rasmieh Odeh testified Thursday about her life as a Palestinian, admitting that she was in an Israeli prison after being convicted in connection with a series of bombings that killed two people in Jerusalem in 1969. It's an admission she failed to make when she applied to come to the United States on an immigrant visa in 1995 and when she applied for, and obtained, naturalization as an American citizen. She is on trial for one count of naturalization fraud as a result. If convicted, the 67-year-old Odeh could face up to 10 years in prison and ultimately be deported. The visa form asks applicants to disclose all the places they've lived for longer than six months since turning age 16. Odeh listed only Amman, Jordan. The naturalization application asks if the person seeking to become an American had ever been arrested, convicted or imprisoned. Odeh checked "no" for each. Truthful answers would have disqualified Odeh from coming to the United States and from becoming a citizen, previous witnesses testified. Odeh claims that her brother filled out her visa application because she understood little English at that time. She trusted him to answer accurately. The form also asks if anyone helped her complete the form, but the box for "no" was checked. For the naturalization, Odeh said she thought the questions about any criminal history only pertained to her life in America, where she has a clean record. Previous questions on the form specifically named the United States. Those, however, dealt with whether she had ever claimed to be citizen, registered to vote, or actually voted here. The criminal history questions, asked as part of a section to show a person is of good moral character, say "ever" in capitalized, bold font. The argument that "ever" could reasonably have been interpreted to be limited to life in America suffered significant damage during testimony by Jennifer Williams, a U.S. Citizen and Immigration Services official. She interviewed Odeh in 2004 as part of the naturalization process. Part of that interview involves going over the application form line by line. Applicants can correct or update any of their answers. She could not remember anything about Odeh or that specific interview. But, in all naturalization interviews, Williams said, when she reads the questions out loud about whether the applicant had ever been arrested, convicted or imprisoned, she includes the phrase "anywhere in the world." "I ask it of all applicants," she said. She was trained to do that and she said it is required. Odeh testified that she would have disclosed her record if she had understood the form was asking about life before she came to the United States. She denied she was trying to hide her record. "It's not [a] secret that I have been in the jail," she said. "Everybody knows." She also was able to say the conviction was a false one. "They [Israelis] can put any charges, of course," Odeh said. "They are the power." U.S. District Judge Gershwin A. Drain sustained a prosecution objection to that statement. Before Odeh took the stand, Drain reminded her and defense attorney Michael Deutsch that pre-trial rulings deemed Odeh's claims of being tortured in Israeli custody and claims that she was wrongly convicted were inadmissible. "I'm not going to allow you to testify about the details of it," Drain said. "We're not here to retry your [bombing] case." Odeh tried to push back, saying she couldn't talk about her life and not describe that experience. "It's my life. It's my case," she said. The only other defense witness, University of Illinois at Chicago Professor Nadine Naber, described the community work Odeh has done to aid and empower immigrant Arab women. Odeh, she said, has a reputation for character and honesty. Odeh's case sparked a mass public relations campaign aimed at pressuring prosecutors to drop the case. That effort was joined by the Arab-American Anti-Discrimination Committee, American Muslims for Palestine, the Council on American-Islamic Relations (CAIR) and a group of 124 feminist academics. 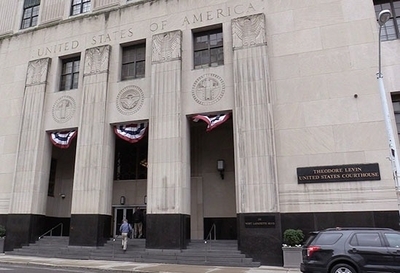 CAIR's Detroit Director Dawud Walid attended the trial Thursday. Odeh was still being questioned by defense attorney Michael Deutsch when the trial recessed for the day. After cross examination Friday, attorneys for both sides are expected to give closing arguments. Because the court adjourns at 1 p.m., however, deliberations may not be completed, or even start, before Monday. Unbelievable. To suggest that an Arab would lie. The word " ever" is a time related word, it has nothing to do with place. Example: Asked by a fictitious prosecutor - "Have you ever been convicted of murder? The response is, "No" The prosecution then presents evidence that the accused had previously been convicted and served time for a murder. When pressed further, the accused says...."Oh, I thought you meant in this courthouse." I know my example is flawed because you are not allowed to introduce previous convictions, but you get my point. Let's see if the judicial system bows to the barrage of righteous Islamic pressure to drop what should be a slam dunk case. We can only hope the President and his Attorney General don't weigh in..